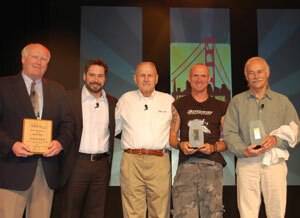 Two of the last awards to be presented at the National Biodiesel Conference Wednesday were given for Inspiration and industry Pioneer. As the Inspiration award winners, Bryan Peterson and Pete Bethune shared their inspiring stories with the conference this morning. Fourteen years ago Bryan Peterson made his way around the world in a small boat powered by a little-known fuel at the time â€“ biodiesel. He completed the 35,000 mile, 2 year trip in a boat called Sunrider. Peterson’s successful adventure generated some of the earliest news on biodiesel, and it paved the way for a world record last year. New Zealander Pete Bethune made headlines for breaking the world speed record for circumnavigating the globe in his Earthrace expedition in 60 days. Both men’s biodiesel message circumnavigated the globe with them. In addition, the NBB presented the Pioneer Award – a special honor to an individual or group who has served the industry â€“ to Kenlon Johannes, the first Executive Director of the National SoyDiesel Development Board, which later would become the NBB. Johannes, a soybean farmer when he represented the board, continues to promote biodiesel through the Kansas Soybean Commission.